These extensions only work in the Firefox web browser. Firefox is an easy, safe and extensible web browser. And it's free. Firefox has a couple of hidden network settings. With this extension, you can tweak these settings, and you might be able to speed up the loading of web pages. You can also increase the maximum number of simultaneous downloads from a site (the default is only six). Instead of changing each setting, you can also choose one of two profiles. The Power profile increases the maximum number of connections and turns on pipelining. The Default profile will reset the settings to the save, default values. The Tweak Network Settings extension is compatible with the latest Firefox release. After installing the extension, the network settings are not changed. You have to change the settings yourself (just choose the Power Profile). You can find Tweak Network in the Tools menu. Kris Mainieri made a video about how to speed up Firefox with Tweak Network. So if this extension improves your web browsing, why aren't these network settings improved by default in Firefox? This is because Firefox wants to adhere to the HTTP specification which says: "A single-user client SHOULD NOT maintain more than 2 connections with any server or proxy." Unfortunately, the specification (from 1999) is outdated at this point. Second, on the server side it doesn't matter. Even the most lightweight webserver can handle hundreds of simultaneous connections. On a high-traffic webserver, your visit is just noise to the server. On a low-traffic webserver, it's only easier to handle your request: the server isn't doing anything else anyway. 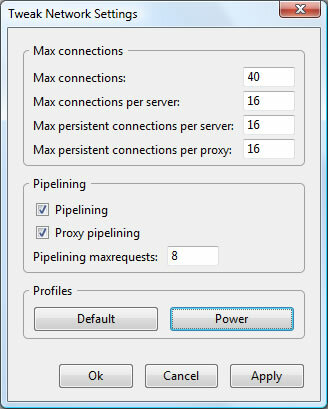 Microsoft also thinks two connections is not enough: Internet Explorer 8 supports six simultaneous connections (see IE8 for developers). So, should your browser adhere to an old specification written in stone or should your browser comply with a changed world? You decide. Update: The latest versions of Firefox also supports more simultaneous connections by default, so improvement is being made. Jan Odvarko uses Firebug to do page load analysis with different settings. Increasing the maximum number of connections clearly has an impact. Use his explanation to measure which settings are best for you.